Developer Quote: "Knowtilus PRO is an elegant, versatile and innovative Web Browser and Text Editor suite packed with all the tools you'll need while browsing, reading, writing, sharing and (re)searching the Web." • Innovative multi-view tabbed web browser: the tabs can be rolled up/down vertically to split the screen among different websites, and the built in text editor (side by side). • Save Web articles in your Reading List and read them anytime, anywhere: Knowtilus strips the superfluous information (Ads, Banners, etc.) and shows the main content in a single column of easy-to-read clean text. Save that clean content to your Reading List and read it later in offline mode. 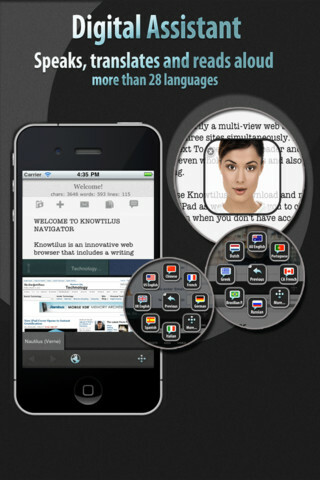 • Translate any web page or your documents from practically any language to more than 28 languages. Knowtilus can also read aloud your translations. • Write articles, papers, posts, notes, to-do lists, reminders, etc. while surfing the web. Share and copy content between the Web and text editor. Export your docs in text or PDF via email, iTunes File Sharing or Evernote, Tumblr, etc. Navigate with extended arrow keys and use punctuation special keys without switching the keyboard. 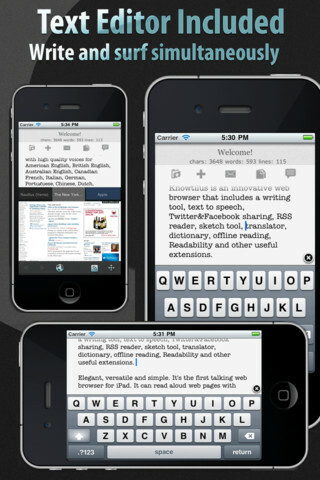 • COMPATIBLE WITH VOICE DICTATION feature in iPhone 4S. Now you can dictate and use your voice in the text editor view instead of typing with keyboard. • Knowtilus has integrated a human-like Interactive Digital Assistant that can read aloud webpages, RSS feeds, etc. in more than 20 languages. You can also type your own text or select any text and have read it. Set the reading speed and voice language to your needs. There are 52 male and female international voices included. • Easily read your RSS channels like a web page and organize them as visual bookmarks. Have Knowtilus read aloud the news from those feeds. • Use your favorite service for saving bits and pieces. Use Dropbox, Evernote, Instapaper, ReadItLater, Google Reader, Pinboard, Tumblr, Twitter, Facebook sharing services to save/post links, images, texts directly from websites and Text Editor. • Easily open web files with extensions .epub, .pdf, .ppt, .doc, rtf, .avi, .key, .xls, .zip, .rar, .pages, .numbers in your other installed Apps like iBooks, Pages, Numbers, GoodReader, PDF Reader, etc. • Doodle with your finger directly over web pages and text documents, create sketches and share them. • Use the Knowtilus integrated QR/barcode scanner to open web pages and automatically find information, compare prices, etc. With all the rich performance features of Knowtilus Pro, you'll be enjoying smooth sailing with no eye strain while searching the web and doing work for business or personal use. There is a similar free version, but this paid version contains a more powerful multiview mode for browser Tabs, better Text to Speech tool (it reads longer texts) and other features. I have made great use of having web pages read to me in a very clear and accurate manner, and have already scanned several items with the built in QR scanner. The Reader function is a bonus (plain text with no ads or images is always welcome), along with the easy-to-use drawing tool. This all-inclusive productivity app is too good to pass up, and will definitely make your work hours on the web enjoyable and easier. COOL CONCLUSION: "Multitasking folks who make use of text-to-speech functions will find Knowtilus Pro a solid workhorse app to add to their collection."